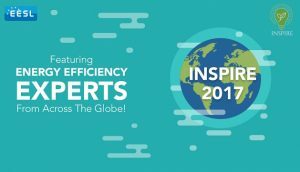 Energy Efficiency Services Limited (EESL) on November 27, 21017, organised the first edition of the International Symposium to promote innovation & research in energy efficiency (INSPIRE 2017) in Jaipur. EESL is a joint venture of central public sector enterprises – NTPC Ltd, PFC, REC and Powergrid. 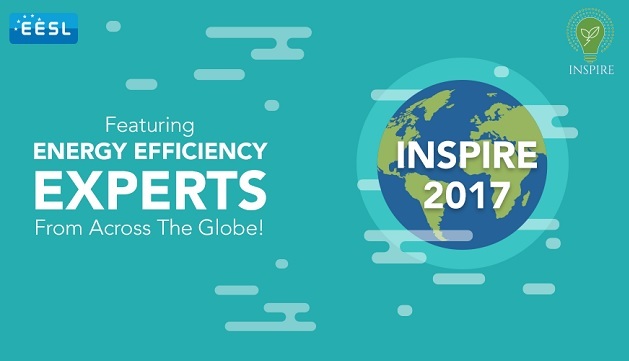 INSPIRE 2017 has been organised in association with World Bank and Alliance for an Energy Efficient Economy (AEEE). INSPIRE 2017 is a global conference which aims to bring together various stakeholders like policymakers, innovators, financiers to showcase best practices in the sector. It is designed to provide global and national thought-leaders and implementers to expand perspectives on energy efficiency. World Bank Group’s senior director, John Roome expressed concern on mitigating climate change and said that India is the third largest energy consumer in the world. In India, the World Bank is proud to be partnering with EESL on a major $300 USD million programme, which is a long-term low-cost loan. The next five years will be critical for if we want a world that we would like our children to live in. And bold action on Energy Efficiency will be a key part of that action, Roome said. Several global organizations like the Asian Development Bank, African Development Bank, Asian Infrastructure Investment Bank, International Finance Corporation, The World Bank, International Energy Agency, International Partnership for Energy Efficiency Cooperation, Clean Energy Ministerial, Copenhagen Center on Energy Efficiency, GIZ, will also share their perspectives at INSPIRE. A mobile app for EESL’s various programmes was also launched which allow consumers to connect with the organisation for its various programmes, lodge complaints and track real-time complaint status. Through an innovative market-led approach towards energy efficiency, India has charted its progress towards being a low-carbon economy, through the implementation of large-scale zero subsidy initiatives like Unnat Jyoti by affordable LEDs for All (UJALA), street lighting national programme, electric vehicles, smart meter programme, solar rooftop projects etc.